Did These Ronda Rousey Photoshops Go Too Far? More than a week after UFC 193, people are still making a ton of hilarious Ronda Rousey photoshops. Have they gone too far this time? UFC 193 was one of the craziest MMA events of all time, and it all boiled down to the main event. Ronda Rousey, the heavily promoted bantamweight queen of the UFC, would take on former boxing champion and massive underdog Holly Holm in the main event. Perhaps we were all guilty of thinking this would be a squash match, at least in favor of ‘Rowdy,’ but the truth couldn’t have been further from that idea. Almost as shocking as the insane second round knockout win for Holm was the fan backlash in the immediate aftermath. 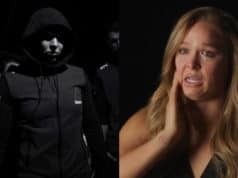 Countless memes and gifs flooded the web of Rousey’s now notorious and crushing defeat to ‘The Preacher’s Daughter,’ but why? Maybe there are just lots of haters out there, or perhaps fans have just had enough of getting the next ‘big thing’ shoved down their throats at every promo opportunity. Whatever the case, the response to Ronda’s first loss as a pro and subsequent relinquishing of the title she held for so long has been unprecedented. The only other time in recent memory that a big UFC name has got so much troll attention would probably be when Jon Jones failed the drug test for cocaine. There’s been mixed reactions to the Ronda Rousey UFC 193 meme saga, but surely part of everyone sees the humour and irony given the circumstances? 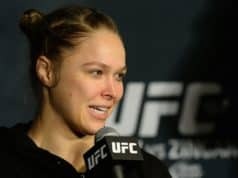 Rousey was making statements like ‘no one deserves to beat me,’ and ‘I could beat everyone in the division with one hand.’ Of course the inevitable element of theatrics is present in every high profile fight these days, but perhaps Rousey’s convincing portrayal of the heel character and the UFC’s non-stop promotion of ‘the world’s most dominant athlete’ culminated to help tumble the house of cards we all secretly knew it was. In any eventuality, the constant hype of ‘Rowdy’ began to wear on most of us, steadily grinding fans down to the point that they were watching more UFC ‘movie style’ promos of Rousey on fight night than actual fights themselves. Come to think of it, you could easily argue that the UFC hype train is more to blame for Rousey’s new found meme fame than the ex-champion is. 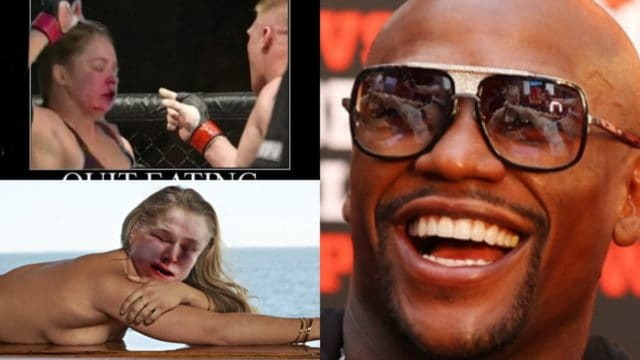 Skip to page 2 to see some brand new Ronda Rousey photoshop jobs by the guys at TheMMACommunity.com…..